Less is more, we often hear. But sometimes less is just less, as it is with too many genome-scale metabolic models. These models still have difficulty coping with tissue- and cell-specific differences. That is, they often fail to reflect how similar metabolic pathways may lead to different outcomes, depending on pathway context—whether a pathway is being followed in one tissue versus another, or whether it can take different turns in health or disease. To help overcome this problem, researchers at Rice University suggest going beyond the usual approach, which they characterize as minimalistic. The usual approach, they say, amounts to stripping down a generalized model to fit a tissue- or cell-specific context, a process that can remove essential reactions from metabolic modeling. To preserve detail and better reflect tissue- and cell-specific context in metabolic modeling, the Rice laboratory of bioengineer Amina Qutub, Ph.D., designed an algorithm, Cost Optimization Reaction Dependency Assessment (CORDA). In the new CORDA algorithm, metabolic reactions not supported by experimental data are assigned a high “cost” that gives them less importance. 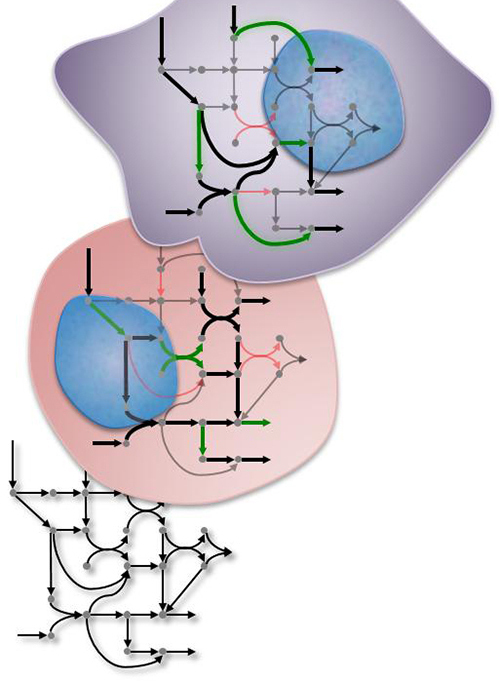 For accuracy, this cost is minimized in a method that depends on flux balance analysis, a standard method for simulating metabolism in a network. The researchers expect their algorithm will be a broad tool to model cell- and tissue-specific metabolism. In one example, the team looked at 271 metabolites known to be present in all of the models. The researchers found that two—both essential to fatty acid and glycerophospholipid pathways—stood out as essential selectively for cancer models. This comparison, as noted in the quoted passage above, also highlighted the up-regulation of folate metabolism, the down-regulation of thiamine metabolism, and tight regulation of oxidative phosphorylation in cancerous tissues.